The Munster head coach believes his side was good enough to qualify for the quarter-finals in Europe. Captain Peter O'Mahony cuts a disconsolate figure at the final whistle. MUNSTER HEAD COACH Anthony Foley said he was frustrated and annoyed after a Munster team he believes was good enough to qualify for the quarter-finals of the Champions Cup crashed out of the tournament. A resounding 33-10 defeat to Saracens at Allianz Park ended the province’s hopes of advancing out of Pool 1 of the competition and left Munster facing a dead rubber against Sale Sharks at Thomond Park next weekend. Foley’s side gave perhaps their weakest performance of the the season against the impressive Premiership outfit, only adding to the sense of disappointment. “It is obviously not something we planned for,” said Foley post-match in London. Foley and his captain Peter O’Mahony cut understandably disconsolate figures in the press area at Allianz Park, owing up to the fact that Munster simply hadn’t delivered. 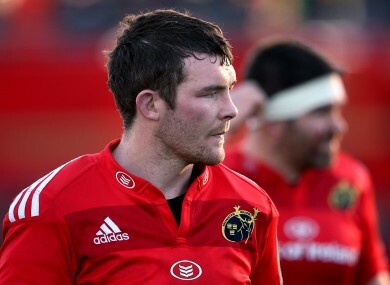 A notably high error count, even from the usually mistake-free Paul O’Connell, meant Munster struggled to get any sort of stranglehold on the momentum of the game. Within minutes of the very first kick-off, scrum-half Duncan Williams had been blocked down and Munster were under pressure. From there, the Saracens onslaught never truly lifted. “We couldn’t get out of that corner from early on in the game,” sighed Foley. Every time we shifted up the pitch we gave them an easy access to get back in there. When we got momentum into the game, when we got good forward, we gave away the ball cheaply and they turned us. “I am sure if you look at it you will see a lot of big errors before they score and that was frustrating for us because that it is a leg-up that they don’t need when they’re playing at home and have their dander up. Email “Foley left frustrated and annoyed after Saracens dismantle Munster”. Feedback on “Foley left frustrated and annoyed after Saracens dismantle Munster”.